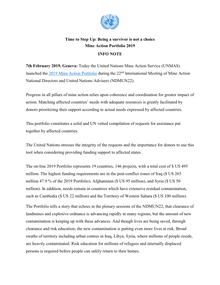 7th February 2019, Geneva: Today the United Nations Mine Action Service (UNMAS) launched the 2019 Mine Action Portfolio during the 22nd International Meeting of Mine Action National Directors and United Nations Advisers (NDMUN22). 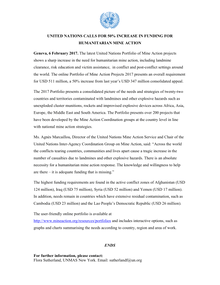 The United Nations Mine Action Service (UNMAS) has received a contribution of USD 9.3 million to the United Nations Voluntary Trust Fund for Assistance in Mine Action (UN VTF) from the Government of Japan to undertake critical humanitarian mine action programming in Syria, Iraq, Afghanistan, the Democratic Republic of the Congo, Sudan and South Sudan. 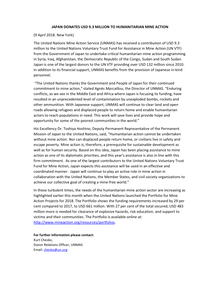 Japan is one of the largest donors to the UN VTF providing over USD 132 million since 2010. In addition to its financial support, UNMAS benefits from the provision of Japanese in-kind personnel. 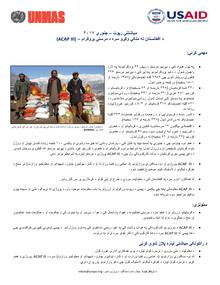 The United Kingdom, through its Department for International Development (DFID) has committed to clearing a further 20 km² of land and 1,000 km more of priority routes for humanitarian aid delivery in Afghanistan and Sudan, in partnership with the United Nations Mine Action Service (UNMAS). This funding is part of DFID’s global efforts to address the landmine issue through a multi-year £100 million UK aid package announced last year. 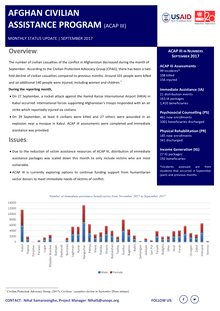 The conflict in Afghanistan continued to severely impact civilians in November. According to the Civilian Protection Advocacy Group (CPAG), 104 people were killed and 181 were injured throughout the month. 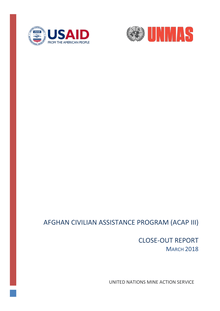 ACAP III has now completed the majority of all assistance and capacity building components to prepare for project closure on 14 February 2018. This will be the final monthly update. 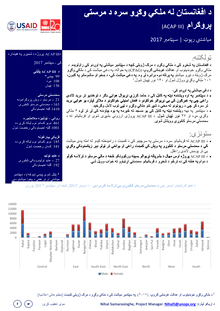 The number of civilian casualties of the conflict in Afghanistan increased during the month of October, compared to the previous month. According to the Civilian Protection Advocacy Group (CPAG), 435 casualties were documented in October in which 200 people were killed, including 11 children and 8 women; and another 235 people were injured, including 16 women. The number of civilian casualties of the conflict in Afghanistan September. 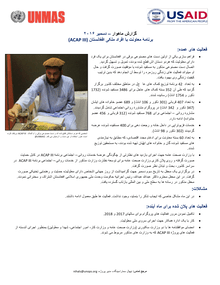 According to the Civilian Protection Advocacy fold decline of civilian casualties compared to previous months. Around 101 people were killed and an additional 140 people were injured, including women and children. 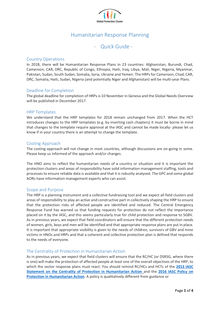 In 2018, there will be Humanitarian Response Plans in 23 countries: Afghanistan, Burundi, Chad, Cameroon, CAR, DRC, Republic of Congo, Ethiopia, Haiti, Iraq, Libya, Mali, Niger, Nigeria, Myanmar, Pakistan, Sudan, South Sudan, Somalia, Syria, Ukraine and Yemen. The HRPs for Cameroon, Chad, CAR, DRC, Somalia, Haiti, Sudan, Nigeria (and potentially Niger and Afghanistan) will be multi-year Plans. 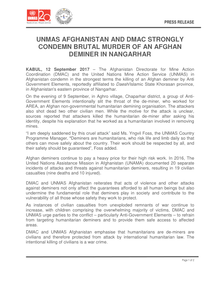 KABUL, 12 September 2017 – The Afghanistan Directorate for Mine Action Coordination (DMAC) and the United Nations Mine Action Service (UNMAS) in Afghanistan condemn in the strongest terms the killing of an Afghan deminer by Anti Government Elements, reportedly affiliated to Daesh/Islamic State Khorasan province, in Afghanistan's eastern province of Nangarhar. 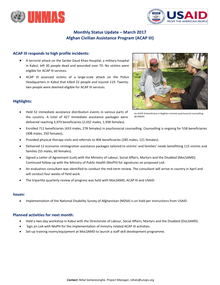 ACAP III substantially completed its immediate assistance response to the victims of the explosion on the 31st of May in Kabul which reportedly killed 150 and injured approximately 400. A total of 486 families were provided with food and non-food packages. The provision of ACAP III short-term services are continuing. 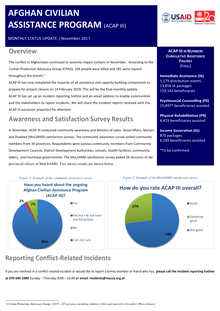 ACAP III field teams assessed 241 conflict related incidents, associated with 149 killed and 332 injured victims, throughout the country during July. 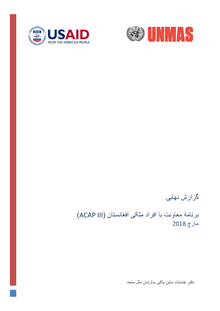 • ACAP III responded swiftly to a large vehicle-borne suicide attack in Kabul on 31 May, 2017 that reportedly killed 150 and injured approximately 400. 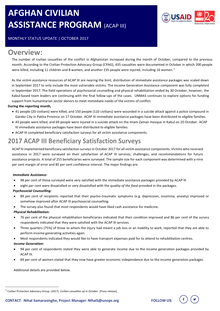 During the month of June, staff assessed 355 victims, out of which 215 were found to be eligible for ACAP III assistance. Immediate Assistance packages were distributed to 200 families. 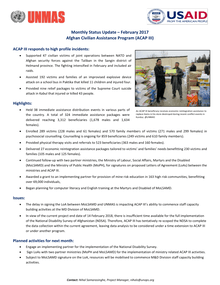 • ACAP III field teams assessed 239 conflict related incidents for ACAP III eligibility. The incidents were associated with 163 killed and 229 injured victims. 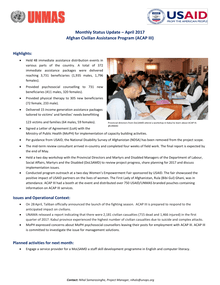 • ACAP III field teams assessed 363 conflict related incidents for ACAP III eligibility. 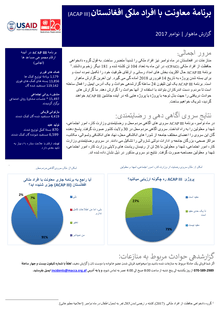 The incidents were associated with 248 killed and 596 injured victims. • Held 36 immediate assistance distribution events in various parts of the country. 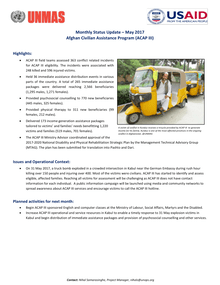 A total of 265 immediate assistance packages were delivered reaching 2,566 beneficiaries (1,295 males, 1,271 females). 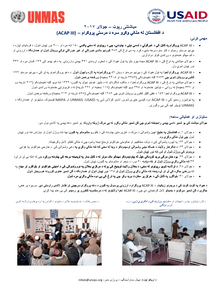 • Provided psychosocial counselling to 770 new beneficiaries (445 males, 325 females). • Provided physical therapy to 311 new beneficiaries (99 females, 212 males). - Held 48 immediate assistance distribution events in various parts of the country. 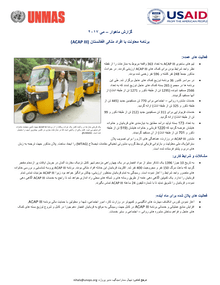 A total of 372 immediate assistance packages were delivered reaching 3,731 beneficiaries (1,935 males, 1,796 females). 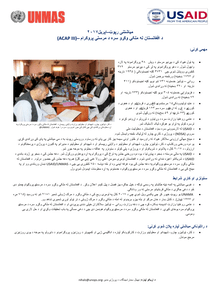 - Provided psychosocial counselling to 731 new beneficiaries (411 males, 320 females). - Provided physical therapy to 305 new beneficiaries (72 female, 233 male). 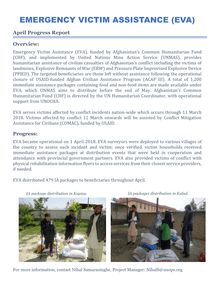 - Delivered 15 income generation assistance packages tailored to victims’ and families’ needs benefitting 123 victims and families (64 males, 59 females). • A terrorist attack on the Sardar Daud Khan Hospital, a military hospital in Kabul, left 30 people dead and wounded over 70. 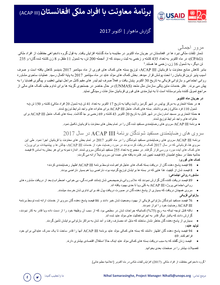 No victims were eligible for ACAP III services. 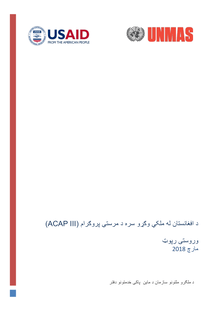 • ACAP III assessed victims of a large-scale attack on the Police Headquarters in Kabul that killed 22 people and injured 119. 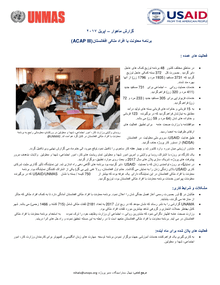 Twentytwo people were deemed eligible for ACAP III services. 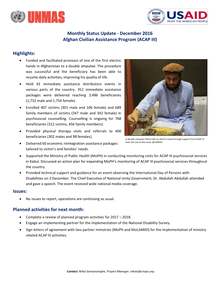 - Supported 47 civilian victims of joint operations between NATO and Afghan security forces against the Taliban in the Sangin district of Helmand province. The fighting intensified in February and included air raids. 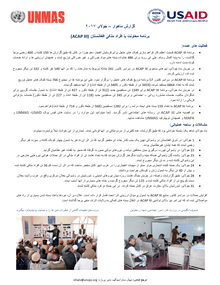 - Assisted 192 victims and families of an improvised explosive device attack on a school bus in Paktika that killed 11 children and injured four. 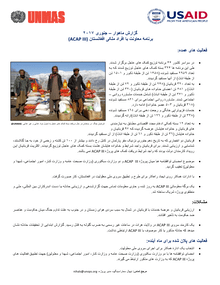 - Provided nine relief packages to victims of the Supreme Court suicide attack in Kabul that injured or killed 43 people. • Held 46 immediate assistance distribution events in various parts of the country. 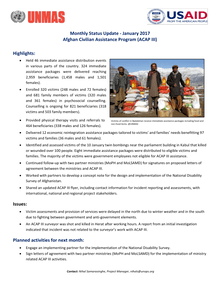 324 immediate assistance packages were delivered reaching 2,959 beneficiaries (1,458 males and 1,501 females). 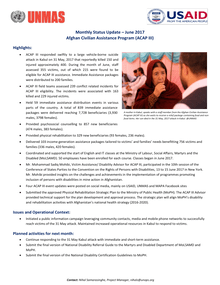 • Enrolled 320 victims (248 males and 72 females) and 681 family members of victims (320 males and 361 females) in psychosocial counselling. Counselling is ongoing for 821 beneficiaries (318 victims and 503 family members). • Provided physical therapy visits and referrals to 464 beneficiaries (338 males and 126 females). Geneva, 6 February 2017. The latest United Nations Portfolio of Mine Action projects shows a sharp increase in the need for humanitarian mine action, including landmine clearance, risk education and victim assistance, in conflict and post-conflict settings around the world. The online Portfolio of Mine Action Projects 2017 presents an overall requirement for USD 511 million, a 50% increase from last year’s USD 347 million consolidated appeal. 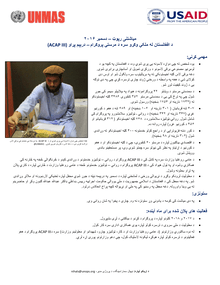 Funded and facilitated provision of one of the first electric hands in Afghanistan to a double amputee. The procedure was successful and the beneficiary has been able to resume daily activities, improving his quality of life. Held 42 immediate assistance distribution events in various parts of the country. 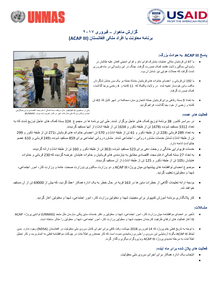 352 immediate assistance packages were delivered reaching 3,486 beneficiaries (1,732 male and 1,754 female). 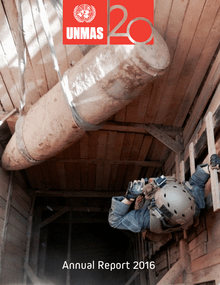 As conflicts rage across the world and the threats posed by explosive hazards perpetuate humanitarian crises and hinder emergency response, UNMAS leadership is needed more than ever.